The town of Lambertville, along the banks of the Delaware River in Hunterdon County, traces its beginnings back to the early 1700s. The area was divided into northern and southern segments by the Bull Line which ran from the river between what is now Delevan and Jefferson Streets, northeastward to the Old York Road, now Route 202. Portions of the northern land were purchased by John Holcombe, who built a stone house there in 1724. The house still stands, now known as Washington's Headquarters, and is located on North Main Street. The John Wey homestead, circa 1711 and now part of the Holcombe-Jimison Farmstead museum, was also a part of this northern section. The portion of the southern section, purchased in part by Emanuel Coryell in 1732, included the charter to run a ferry across the Delaware. Settlements on the New Jersey and Pennsylvania sides of the river became known as Coryell's Ferry. The area played a strategic role in the Revolutionary War, and Washington's troops encamped in a field outside of town while the General and his officers were housed by the Holcombes. After the Coryell land was subdivided around 1802, residential development began in earnest. Some of Lambertville's oldest homes are located along Coryell and Bridge streets. The original post office, run by John Lambert, nephew of the United States Senator, opened around the same time in the present-day Lambertville House hotel. The tiny city's classic mystique is, in part, due to the presence of these historic sites; these and the James Marshall house. By the mid 1800s Lambertville was a burgeoning industrial center. The frontier had moved west, and James Wilson Marshall, from Lambertville, NJ joined a wagon train in 1844 hoping to make a fresh start by farming the fertile land of the California valleys. After arriving in 1845 Marshall established a farm, but left it to take part in the fight for Californian independence from Mexico. When he returned he found his farm ruined and sought employment from John Sutter who was in need of lumber to supply his mill. It was agreed that Marshall was to venture into the mountains, find a suitable site and build a sawmill in the area known as Coloma. And it is here that James Wilson Marshall struck gold. On January 24th, 1848, during his routine check of the new mill race, he found some gold flakes. And thus began the California Gold Rush. James Marshall’s boyhood home, a modest building at 60 Bridge Street, is now home for the Lambertville Historical Society. Documents and displays inside the house tell Marshall’s story. Work on all other projects ceased as "gold fever" spread throughout the local population. Sutter's Fort was virtually abandoned as those previously in his employ left for Coloma. Eventually, the full force of the gold rush was to be felt, as the state's population exploded from 14,000 non-Indian people in 1848 to 250,000 in 1852. Sutter and Marshall never prospered from the gold. Land rights were taken by squatters, and it is known from correspondence to friends in Lambertville that Marshall was taken advantage of by many gold seekers. It is believed that he donated several gold flakes to be placed in the cornerstone of the First Baptist Church, built in Lambertville, circa 1868, across from the Marshall homestead. Marshall remained in California, for a short time he ran a successful vineyard in Coloma and received a small pension from the state, honoring the role he played in its history. He died poor in 1885, and was buried on a hill in Coloma, overlooking the site of the sawmill and that fateful find. California's first historic landmark is a statue of James Wilson Marshall that sits atop his grave. In 1927, the Marshall Gold Discovery State Historic Park was established in Coloma. As California was developing a state park in his honor, the Marshall family home in New Jersey was almost lost to demolition. In 1966, a local Lambertville woman, Alice Narducci, was engaged in what appeared to be a losing battle to preserve the boyhood home of California's hero. The bulldozers had already demolished a portion of the home when the state of NJ finally intervened. The house, which had become the property of St. John the Evangelist Catholic Church, had served as a convent for many years, and an addition had been built onto the back of the home. It was this section that had been destroyed, thankfully leaving the original structure intact. The church had been willing to donate the home to the city of Lambertville if it could be moved, but support was sparse. As the back addition of the home was bulldozed, the state of New Jersey brokered an agreement with the Church that allowed the home to remain on the land, and to be restored by the newly formed Lambertville Historical Society. The parlor has been furnished with period pieces approximating the home’s original inventory. 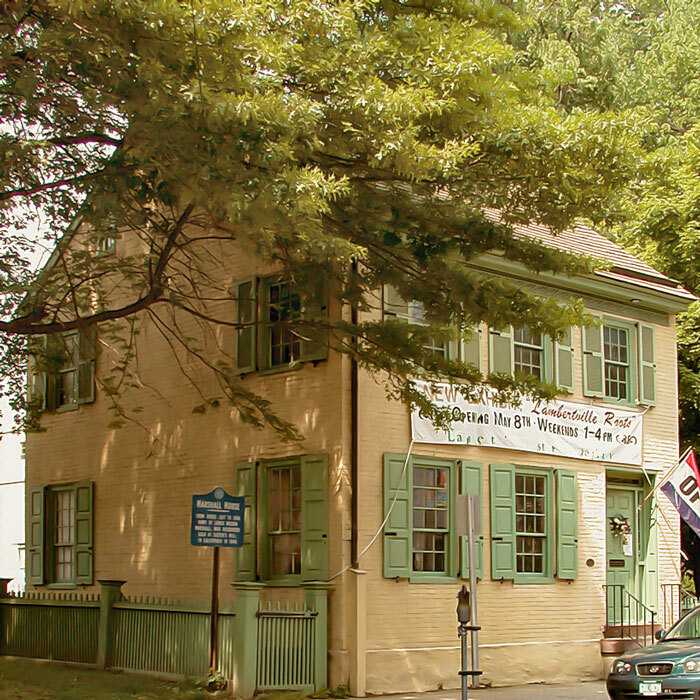 The Marshall House, located at 60 Bridge Street, is now the headquarters of the Lambertville Historical Society. 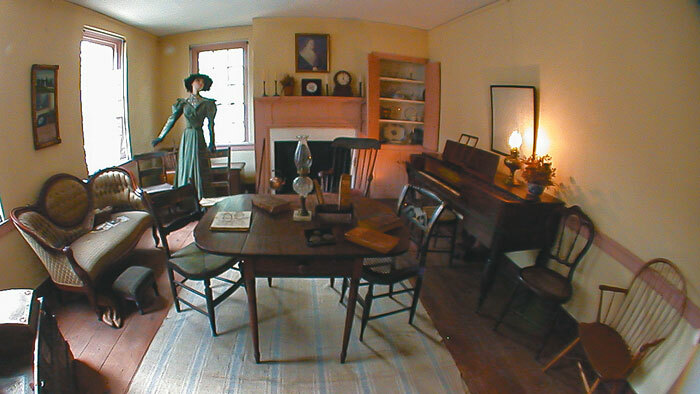 It serves as a museum, preserving both the Marshall home and the history of the town of Lambertville. 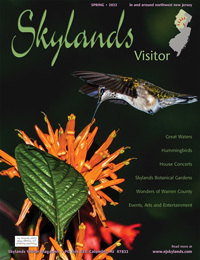 An extensive collection of archived items and documents, rotating educational displays, and the restored home itself are featured. The home was built on a lot purchased from the Coryells in 1816, by James'dd father, Philip Marshall. Philip, a skilled carpenter and wheelwright, built the house from locally dug and fired clay known as "Lambertville Pancake" brick. The decorative Adams-style frieze above the doorway, the chimney cupboards in the parlor, and a beautiful wooden staircase are noteworthy details of this home. Period hardware and some original windows remain. The family sold the home in 1834, following Philip's death. It is then that James Wilson Marshall headed west, to become an inadvertent, yet important, part of American history. The Marshall home, listed on the National Register of Historic Places in 1970, is recognized for its original architectural details as well as its connection to a famous American folk hero. Today, the town of Coloma, California, is filled with historic buildings from the gold rush era, and is thriving as an outdoor recreational center, featuring kayaking and rafting on the American River. And Lambertville, New Jersey has become renown for its antique stores, art galleries, restaurants, and many notable historical buildings. After reaching a commercial peak in the early 1900s, the town had slowly declined, and many of the buildings were simply boarded up and abandoned. With urban renewal funds available in the 1980s, many of the old buildings were purchased and restored by the city, including the Lilly Mansion (now the library) and the A.H. Holcombe house, which now serves as City Hall. Private citizens and businesses also began to restore many of the structures, and the city retains most of its historic character. 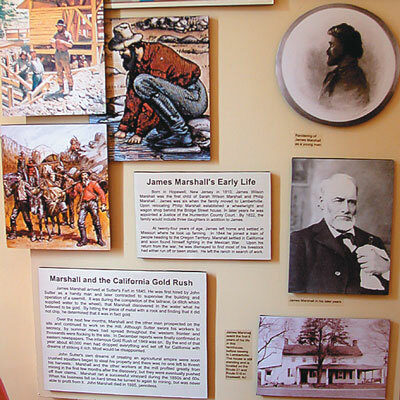 These two towns, separated by a continent, have been united and preserved thanks, in part, to James Wilson Marshall, discoverer of the California gold. The Lambertville Historical Society Museum at the Marshall House, at 60 Bridge Street, is open 1-4pm, every weekend, April through October. It conducts walking tours of Lambertville on the fourth Sunday of those months. An annual house tour is held in October. 609-397-0770.